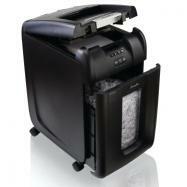 The Swingline stack and shred 300M auto feed shredder is a security level 4 (P-5) micro cut paper shredder. It allows user to stack 300 sheets of paper into the auto feed tray, shut the lid and just press the button for the shredder to shred documents automatically at a speed of 8 ft/min. The Swingline 300M shredder is also equipped with a locking system that locks the shredder at the time of shredding through a 4-digit PIN. The shredder cannot be opened unless the user enters the PIN code. Once the shredding is complete the 300M auto feed shredder automatically unlocks so that another person can use it. A manual slot is included in the Swingline 300M shredder to shred DVD’s/CD’s, credit cards, glossy and folded sheets. The user can shred up to 8 sheets at one time. It shred a single sheet of paper into over 2000 pieces that fall into an 11-gallon pull out waste bin. The 300M auto feed shredder has functions that simplifies shredding and helps increase your productivity level. It includes Intelligent Power Save, Bin Full Indicator and Intelligent Jam Clearance. In addition, the 300M auto feed shredder is also equipped with an Intelligent SelfOil feature that keep the cutting shafts lubricated for efficient shredding. The Illuminated status symbols of the shredder keeps the user informed of the current status of the shredder. The Swingline stack and shred 300M auto feed shredder is an innovative shredder that delivers continuous shredding operations and is perfect for everyday use by 5-10 users. Shred up to 300 legal and letter size sheets automatically and 10 sheets manually in one cycle.